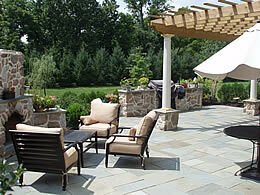 This Particular Pergola was designed using the Trex material and movable Canvas top. 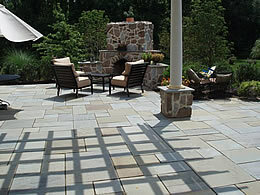 Each Column sits atop a custom Techo-Bloc Pillar with low voltage LED Lighting for night time relaxation. The surrounding patio includes a Techo block bench sitting wall around a Valencia gas fire pit, and custom pondless water feature. Trex Pergola custom painted with retractable canvas. Integrated LED lighting and electrical outlets. 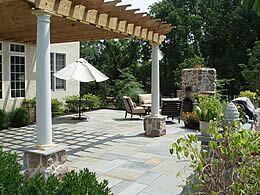 Custom Shade Structure with recessed ceiling and ceiling fan, Techo-Bloc pillars and York caps.